and have come to eat the Wuchang fish. looking afar to the open sky of Chu. better far than idly strolling in courtyard. Today I am at ease. turning a deep chasm into a thoroughfare. Wushan’s clouds and rain till a smooth lake rises in the narrow gorges. The poem’s title, “Swimming” is written as the two, large light blue characters. The superimposed lines of the poem are read vertically from right to left. Although most artistic Chinese calligraphy is executed in some form of traditional script, the calligraphy here is in the simplified script used today in the People’s Republic of China in recognition that Mao composed the poem after the People’s Republic was established. The four red, oval seals across the middle read (from right to left) “practice, determination, skill, and strength” and denote characteristics necessary for success in any endeavor; characters on these seals are in the Great Seal Script (see Artist Seals). 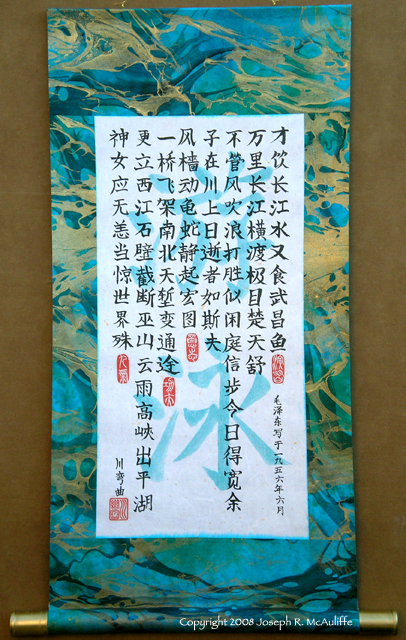 The artist’s 3-character signature, Chuan Wanqu (River Winding) and signature seal are in the lower left corner. The poem accompanies a gyotaku of a Wuchang fish, mentioned in the poem’s first line (see Swimming Wuchang Yu, Gallery 7). Mao Zedong was a strong and avid swimmer. Soon after the first bridge across the Yangtze River was constructed at Wuhan, Mao swam across the river in May, 1956. At that location, the river is about a mile wide and is very swift. Mao was 62 years old and he claimed that the swim took him about two hours and the strong current carried him about 30 li (9 miles) downstream before he reached the other side. Mao also swam across the river in the same location in 1958 and again in 1966, when he was 72 years old. Mao is not alone in these swimming feats. Swimming races across the Yangtze at Wuhan have been held since the 1930s. There have been more than 30 races across the river since 1956. In 2002 the race was named the International Wuhan Challenge Race of Swiftly Crossing the Yangtze River. That year 186 swimmers from around the world entered the race. Due to unusually high water and fast currents, only 34 reached the official finish point; many were carried further downstream to other points. A 19 year-old female university student from Chicago made the fastest crossing in a little over 14 minutes. The poem is about overcoming adversity. The mighty Yangtze has always been a mixed blessing to the Chinese people. Although it provides a highway for boats, the wide river separated northern and southern parts of the country. Fertile silt deposited in annual floods helped maintain productive agriculture, yet occasional, catastrophic floods brought great human suffering and death. The second half of the poem reflects on overcoming some of those hardships through the new bridge and envisions a giant upstream dam that could prevent destructive flooding. The artist visited Wuhan in April, 2007. A trip by ferry across the Yangtze, in sight of the original 1956 bridge, and a delicious dinner of a Wuchang fish in a restaurant in that city inspired the creation of this calligraphic piece. He also swam competitively in high school and marvels at the strength, skill, training, and determination required of anyone who would swim across the mighty Yangtze.